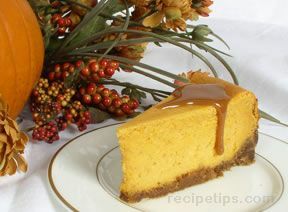 Satiny pumpkin cheesecake with a delicious gingersnap crust. Preheat oven to 300°F. Mix gingersnap crumbs and butter in medium bowl; press firmly onto bottom and 1 inch up side of 9-inch springform pan. Place in freezer until ready to use. Beat cream cheese and sugar in large bowl with electric mixer on medium speed until well blended. Add pumpkin and spice; mix well. Blend in vanilla. Gradually add whipping cream, beating until well blended after each addition. Add eggs, 1 at a time, mixing on low speed after each addition just until blended. Pour into crust. Place pan on baking sheet. Bake 1 hour 20 minutes, or until center is almost set. Run knife or metal spatula around rim of pan to loosen cake; cool on wire rack before removing rim of pan. Refrigerate at least 4 hours or overnight. Cut into 12 slices to serve. 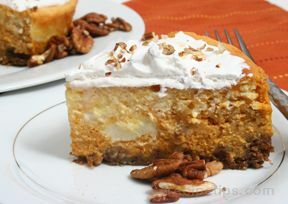 Top each slice with whipping cream, if desired. Store leftover cheesecake in refrigerator.